Hooded sweatshirt with double-needle stitching, double-lined hood with dyed-to-match drawcord, 1x1 rib knit cuffs and waistband with spandex, and front pouch pocket. 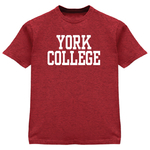 Gildan unisex tee features York College arched over est. 1787 and Y Shield logo. Double-needle sleeves and hem, with a taped neck and shoulders. 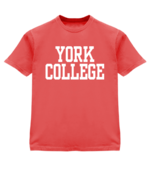 Standard unisex t-shirt in many different colors with screen imprint of York College on the front. Standard short sleeve spider tye-dye t-shirt with York College in block letters screen-printed on the front. 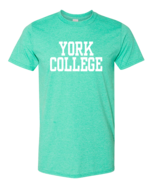 Standard short sleeve Blue Ocean tye-dye t-shirt with York College in block letters screen-printed on the front. Comfort Color soft washed garment offers double needle collar, twill taped neck and shoulders, and double-needle armhole, sleeve, and bottom hems. Gildan crew sweatshirt features preshrunk fleece knit, air jet yarn for a softer feel and reduced pilling, tear away label, double-needle stitching at shoulder, armhole, neck, waistband, and cuffs, 1x1 rib with spandex, and quarter-turned to eliminate center crease. Show off how proud you are to be a Spartan Dad with this perfect Dad tee. 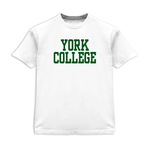 Standard short eternity tye-dye t-shirt with York College in block letters screen-printed on the front. 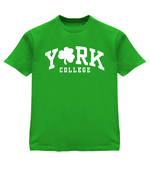 Standard unisex T-shirt with York College Grandparent screen-printed on the front. Preshrunk fleece knit, double-lined hood with color-matching drawcord, satin label, pouch pocket, double-needle stitching at waistband and cuffs, 1x1 rib with spandex, and quarter-turned to eliminate center crease. Double-needle stitching, a seamless rib at neck, and taped shoulder-to-shoulder. Standard short sleeve Neon Rainbow tye-dye t-shirt with York College in block letters screen-printed on the front. 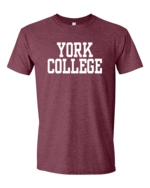 Gildan tee features a standard unisex fit with York College arched over the YCP Seal. 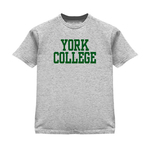 Standard short sleeve t-shirt with York College and the Spartan logo inside the "R" screen-printed on the front. Preshrunk jersey knit, Seamless double-needle 7/8" collar, Taped neck and shoulders, satin label, Double-needle sleeve and bottom hems, and Quarter-turned to eliminate center crease. 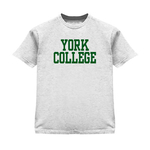 Standard unisex T-shirt with York College of Pennsylvania over Split Y logo and est. 1787 screen-printed on the front. 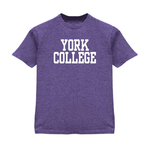 Our Gildan short sleeve tee has a split Y on the front.